I wanted to tell you about this spin workout I did last Friday in class. Fridays are usually reserved for intervals from this instructor that I go to, and I was really feeling extra excited for sprints and hills. As a previous spin instructor, I tend to be slightly picky with classes I attend, and this instructor has it all -- the fantastic tunes, just the right amount of variety, and she doesn't talk the whole time at an annoying pitch. So back to the killer workout - After a good ten-minute warm-up, the instructor announced that she had the intervals planned; 30 seconds per interval. We started off with 30 seconds of a standing climb, 4-second jumps (four beats out of the saddle, four back in the saddle), then back in the saddle to flush out the leggies. She slowly added a new component onto each round of the intervals, and we ended up with something that turned out to be one of the best spin workouts I've ever done. She always gives us a few minutes of "freestyle" ("whatever you want to do, as long as it's work! "), then a sprint out at the finish. Cooldown and stretch. Donesies. Give this workout a try if you're spinning on your own -- it's funsies! Why clip-in to your Spin/Indoor bike or Bicycle...? So I get this question more often than you'd think. Cyclists and Triathletes, whether professional/elite or amateur, use clipless pedals for several reasons, including EFFICIENCY and PERFORMANCE. In regards to Spin/Indoor Cycling Instructors and consistent class patrons, it's a matter of preference. What it all really comes down to is your foot being retained, closely following that circle rotation that is necessary for a bicycle (or flywheel of an indoor bike) to move forward. The more efficient the rotation, the better the performance. Even if your foot retention is held by a foot cage, there's still wiggle-room. With that bit of wiggle-room, an improper upstroke can occur, and therefore, the most efficient form goes out the window. There's also the efficiency of power transfer. While clipping into your pedals will keep you connected to your power train at all times, using flat pedals won't give you the same advantage of pulling UP and pressing DOWN and forward with the same forces. When you clip-in, the foot retention is solid, with hardly any wiggle. You can actually tighten or loosen your clips to your heart's (or foot/ankle/lower leg's) desire, to where you have hardly any wiggle, to perhaps just a little. That's up to the rider. What's also up to the rider is the STYLE of clipless pedal, but that's an entirely different post topic. :) It tends to get a bit more strategic and particular at that point, so don't worry about it. 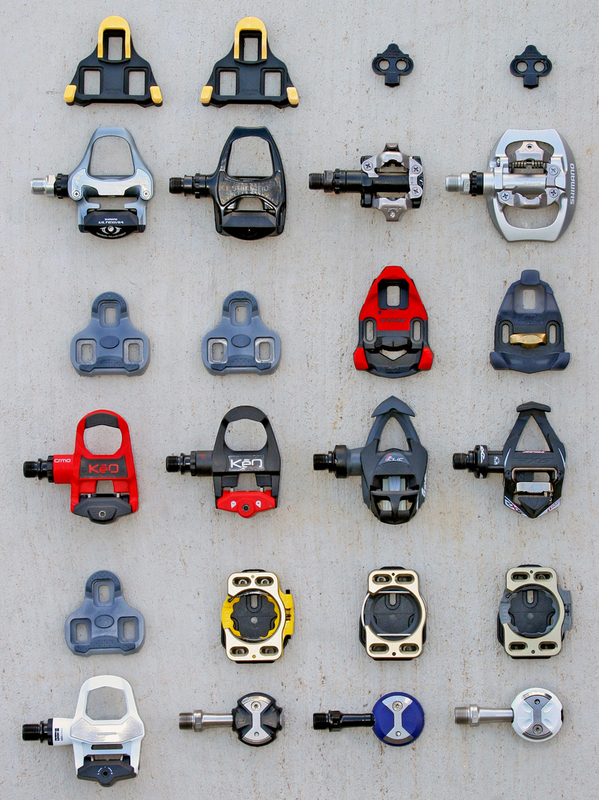 The most common type of clipless pedal is SPD. You'll usually find these on the other side of a foot cage on a spin bike at your gym. The shoes aren't really that expensive if you find them on Amazon or Ebay, and of course, your local cycle shop! DO NOT...I repeat...DO NOT FORGET about my Fave Things Giveaway HERE! Cyclists readers - DO YOU CLIP IN? Favorite spin workout component? Sprints? Hills? Jumps? I LOVE SPINNING. I want a bike. I will fall over on said bike when trying to clip out. It will hurt. And yet, I want it for myself. Always clip in! Much better workout. You're not getting the full effect of the pull otherwise.